The E60X™, supplies a high-capacity expansion chassis, providing 60 drive bays in only 4U of rack space giving IT professionals ultimate storage capacity in the smallest footprint, with enterprise class reliability and superior ease of use. 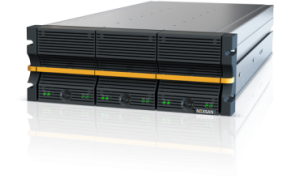 By linking the E60X expansion chassis to Nexsan’s SATABeast®, SASBeast®, E18 or E60 storage arrays, organizations can achieve new levels of efficiency being able to add more capacity while reducing power, space and cost. In comparison to other systems, the E60X provides three times the capacity, needs one third of the space and because of Nexsan’s AutoMAID level 4 technology–uses up to 85% less energy consumption. Three self-contained active drawers house 20 SAS/SATA disk bays in each as well as tachometer-controlled push and pull fan modules. The entire drawer extends for easy servicing while continuing with full production. The E60X attaches to the SATABeast or SASBeast through the expansion slots available on the latest 8Gbit fibre channel Beast controllers. The E60X 120TB expansion solution does not necessitate special tools or downtime for additional expansion; IT professionals need only to plug the needed disk drives into any unused disk bay. Also, the chassis is easily managed by the SASBeast, SATABeast, E18 or E60 Web-based manager interface.